The Shining Honeycreeper is a vibrant member of the tanager family. It is a small (10 cm), plump honeycreeper with a long, thin decurved bill and short tail. This spunky little bird lives up to its name—males are purplish-blue with black throat and chest patch, black wings and vibrant yellow legs with starkly contrasting black toe nails. Females are equally beautiful, green with a distinct blue malar stripe and blue streaking on the breast, and a buffy throat. Shining Honeycreepers live in the upper levels of the forest and forest canopy. They feed on fruits, insects and nectar. They glean arthropods from vines and twigs, and will also sally for flying insects and probe in dead leaves for hiding insects. They typically forage in pairs or small groups, and often associate with mixed flocks of tanagers and other fruit and insect eating birds. 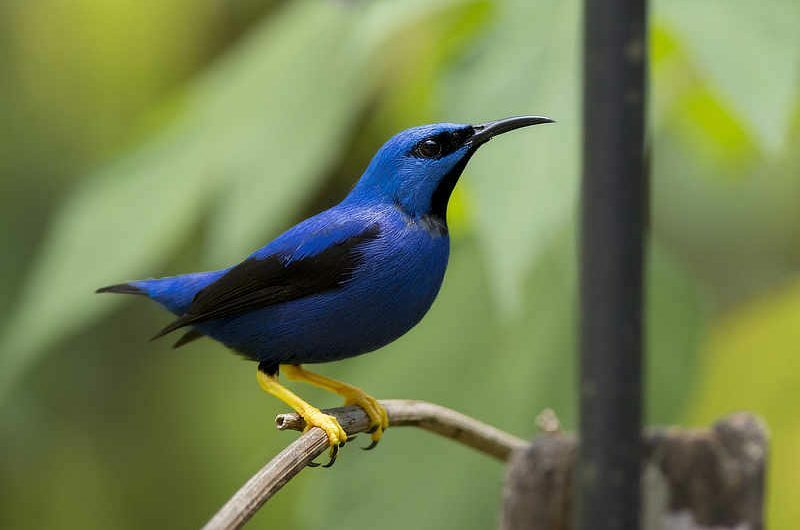 They can be fairly aggressive, and often displace the larger Red-legged Honeycreeper from food sources. They will also come to hummingbird feeders for nectar. When it comes time for breeding, the female constructs a shallow, thin cup nest of fibers, attached at the rim to slender twigs. She lays 2 eggs, rather dark in color; eggs can often be seen through the thin nest design. The female incubates the eggs for 12-13 days. Nestlings are fed by both male and female, a diet predominantly of insects; however, older nestlings are fed berries and fruits as well. Young fledge at 13-14 days of age. The Shining Honeycreeper ranges from southeastern Mexico to northwestern Colombia. In Panama, this species is fairly common in the foothills up to 1600 meters on the Caribbean slope, and also along the Pacific slope from the Canal area eastward. They are common at feeders in Cerro Azul, and are occasionally seen from the observation deck at the Canopy Tower and at the Canopy B&B feeders. Close cousins: The Shining Honeycreeper is very closely related to the Purple Honeycreeper of South America, and the two were once considered conspecific; however, they do overlap in their range in far eastern Panama and northwestern Colombia and breed sympatrically. Here, close attention must be paid to their identification, as males especially can be difficult to distinguish. The Shining Honeycreeper overlaps greatly throughout its range with the Red-legged Honeycreeper, but can easily be distinguished first and foremost by its bright yellow (not red) legs.